On Sept. 4, the Agriculture Department will accept applications from farmers who produce corn, cotton, dairy, hogs, sorghum, soybeans and wheat — products hit by retaliatory tariffs after the U.S. imposed a levy on $34 billion worth of Chinese imports. 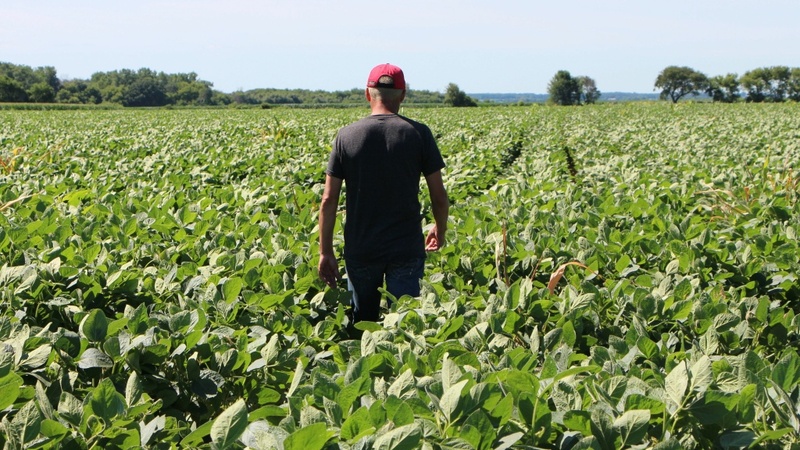 Last month, farmer Terry Davidson walked through his soy fields in Harvard, Ill. The Department of Agriculture will pay $4.7 billion to farmers growing soybeans, cotton, and other products hit by tariffs in the Trump administration's hardline trade war with China, announcing the first batch of payments from a $12 billion government aid package. Starting next Tuesday, Sept. 4, the agency will take applications from farmers who produce corn, cotton, dairy, hogs, sorghum, soybeans and wheat — products that were targeted in China's retaliatory tariffs, after the U.S. imposed a 25 percent levy on $34 billion worth of Chinese imports. Most of the money – more than $3.6 billion – will go to soybean farmers. China has been the No. 1 export market for U.S. soybeans, buying nearly a third of all American-grown soybeans in 2017. "Our farmers work hard, and are the most productive in the world, and we aim to protect them," said Agriculture Secretary Sonny Perdue, announcing the payment plan. Soybean prices have fallen this summer — a process that started even before the U.S. and China hit each other with tariffs in early July. "This will provide a real shot in the arm for our growers, who have seen soybean prices fall by about $2.00 per bushel, or 20 percent," since June, said American Soybean Association President John Heisdorffer. Those helped the most, Heisdorffer added, will be the farmers who didn't have contracts in place ahead of their harvest, and are facing a possible gap in their ability to pay for next year's planting season. Another farmers' group, the Minnesota Soybean Growers Association, welcomed the news of financial help, even as they urged President Trump to end the trade war. "Right now, farmers are hurting, and this aid will allow a momentary reprieve," said MSGA President Michael Petefish. "Unfortunately, if this trade war continues much longer, this aid package will feel less like a Band-Aid, and more like a reminder of the trade relationships we lost and must rebuild." The government payout was sharply criticized when it was announced last month, with farmers and President Trump's fellow Republicans saying that the administration was paying billions in response to a problem it created. As NPR's Brian Naylor reported in July, lawmakers in Congress were not required to vote on the billion-dollar farm relief package – a vote that could have had sharp negative fallout, with midterm elections looming in November. Instead, Naylor reported, "Officials say they will be using a Depression-era program, the Commodity Credit Corporation, to secure money from the U.S. Treasury and will not need to ask Congress for the funds." The main aid package within the Commodity Credit Corporation is titled the Market Facilitation Program. It's meant for farmers whose average adjusted gross income over the past three years was less than $900,000. Other relief packages include the Food Purchase and Distribution Program, which will buy surpluses from reduced trade, and the Trade Promotion Program, to seek new export markets for U.S. farmers. As he announced details about the aid package, Secretary Perdue said that the federal effort "buys time for the president to strike long-lasting trade deals to benefit our entire economy."